Raphael Richard Haar, on Facebook, argues that Israel requires the “west bank” territories in order to have defensible borders. His 3D map seems pretty persuasive to me. A one dimensional picture is worth a thousand words. How many words is a three dimensional picture worth? 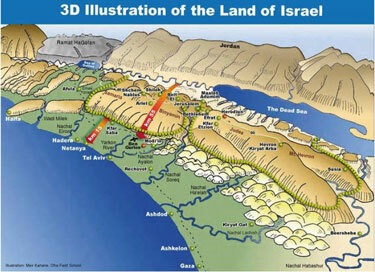 Notice the green flat coastal plain, 70 percent of Israels population resides in this region. 80 percent of Israels industrial base is also in this region. Conclusion; The Jewish Communities, towns villages and cities on top and in Judea Samaria are not an “obstacle to peace” they prevent war. If Israel where to come down from these mountains she would be a tasty little morsel that would invite invasion from the global Islamic supremacist movement that surrounds battle ship Israel, who is floating in a Sea of Arab tyranny. The Biblical heartland, where Israel maintains her existence. 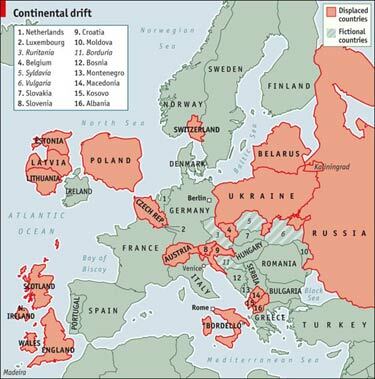 The Economist redraws the map of Europe, giving Poland and Lithuania a break by moving them out of their inconvenient position between Germany and Russia. Great Britain gets to bask in the sun off the coast of Spain. And there are other helpful changes. As this Politico map again demonstrates, outside a few urban enclaves, this is basically a Republican-voting center right country. “Scariest thing you’ve ever seen.” says my wife who sent me the link to this map illustrating the impact of the recession county by county. the Archives of Never Yet Melted in the 'Map' Category.